This is a great post for bloggers AND brands because in the end, we all want to get new readers and more traffic to our site and there are worthwhile ways to do that. 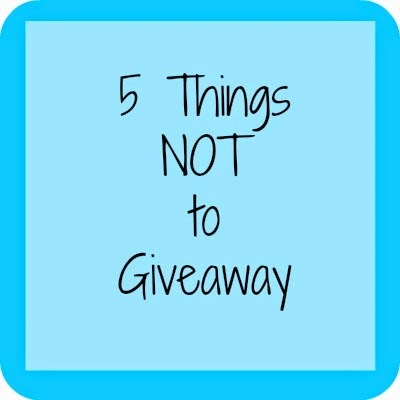 One of those ways is to run a giveaway but in order to make it worth the blogger's time, the brand's time, AND the reader's time, there are 5 things you shouldn't bother running a giveaway for. 1. A gift certificate worth less than ANY items in the shop. If you offer a $50 gift certificate but the cheapest item on the store's website is $150 that's not really fair. A true contest is something that you win...not something that you buy. And even if the people entering don't realize that at the time, when it comes time to choose a prize, they may not bother. 2. A Certain Size of Clothing. I hate hate hate HATE when a brand sends me an item and tells me it's for a giveaway... Okay, so a small blouse for the winner..but what if the winner can't fit into that? It's kind of stupid.... and now when a company tries that I tell them no way! 3. A Discount on a Purchase.Sorry but unless it's an insane deal like $200 off a Dyson vaccum cleaner (lol), most people don't want to enter a contest where the only prize is a discount off of something they HAVE to spend money on. There are obviously a few exceptions..maybe a really neat accessory is $20 and that's fine but when it comes to something like a $5 book...I'd rather just buy it for $5. 5. A used or damaged item you already own. As bloggers, we get lots of cool freebies we can give away again but please make sure it's not used or worn or damaged. Even if you try to play it off like it's new, if it's not, you'll look really bad! Reputation is important! Exactly!! Thanks for stopping by ! Bless you! Bless you about a certain size of clothing. Can't tell you how many give-aways I couldn't enter because I am plus-sized, it means even more that you mentioned that because you are nice and slim! Thank you!! I know it's really not right and the companies kind of get away with just being able to get rid of one specific piece of clothing so it's not really fair to the people entering the giveaways! Yes!!! Excellent. I've seen a lot of giftcards that are for a lower value than anything that the shop sells--which means that they end up just being a "discount", which really isn't worth winning! Yea and it's kind of unfair to the people entering since technically they are all promoting the giveaway by adding/tweeting on social media ya know? As someone who has entered a lot of giveaways, I think these are all great tips. Youre welcome glad you enjoy! I agree with all of these, and I'd like to add one - Restaurant.com gift certificates. Bloggers tout that they are giving away a $50 Restaurant.com gift certificate, but a) they aren't really gift certificates, they are coupons; b) Restaurant.com offers coupon codes constantly with up to 90% off every single month, which basically makes the value of a $50 "gift certificate" less than $5; and c) most all of the restaurants in my city who once offered Restaurant.com gift certificates now have big signs posted stating "We no longer accept Restaurant.com gift certificates effective immediately." I'm not saying Restaurant.com is a scam, I'm simply stating that they are worth a lot less than some bloggers claim! OMG no i totally agree and understand!!! Those are the same tips I follow for giving gifts, in a way. Really good advice!